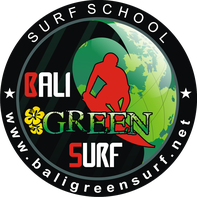 Bali Green Surf School offers you a variety of services. During your surf lessons you will be taught by experienced surf instructors, who will make Sur you will have the best possible surf experience. They will adjust to your skills and wished and take you to the best surf spots in Bali! All lessons are subject to weather and wave conditions. Any doubt, please contact us. The beginner surfing class in Bali is for non-experienced who want to refresh the basics. You will learn to handle the board, the correct paddle-technique, take-off and about the ocean conditions and safety. You are able to stand up and you have caught and ridden green waves already? Then you are ready for the intermediate guiding. We will work on your technique and teach you forehand and backhand turns. We will guide you 'outside' and show you the right position to observe the sets of waves as they approach. You will lean how to duckdive, chose the right waves and do maneuvers like cutbacks, bottom and top turns. *25% off for the whole month of April, when booking through our website. No Agents! Make your first experiences on a Softboard and easily ride your first waves. Our guides will make sure to keep you safe the whole time and have great experiences in the water. This is the right choice for you if you want to enjoy surfing with your whole family. We offer this package for two adults with two kids. Private surf guiding is specifically adjusted to your skills. Use the opportunity to concentrate on certain areas, catch more waves and get your surfing to the next level. Our surf trips offer you the opportunity to surf different waves around Bali. However, the destination will mainly depend on your surf level, the wave and weather conditions. A full day surf trip package will be 8 hours including all the equipment, a driver and guide and refreshments.